he quick repair kit for trucks and buses re-mobilize within 5 minutes for truck tyres with a pressure up to 12 bar (160 psi) There is no simpler and more effective way to repair a tyre puncture - and to continue your journey within less than 5 minutes. Tyre sealant in 1 l pressure bottle, 45 cm hose with valve connector, carrying bag, valve insert remover long, valve insert remover mini, 10 m hose with manometer. This tyre sealant has been newly developed to prevent chemical reactions with aerosols. The aerosol can provides more safety margin than is required by applicable regulations. 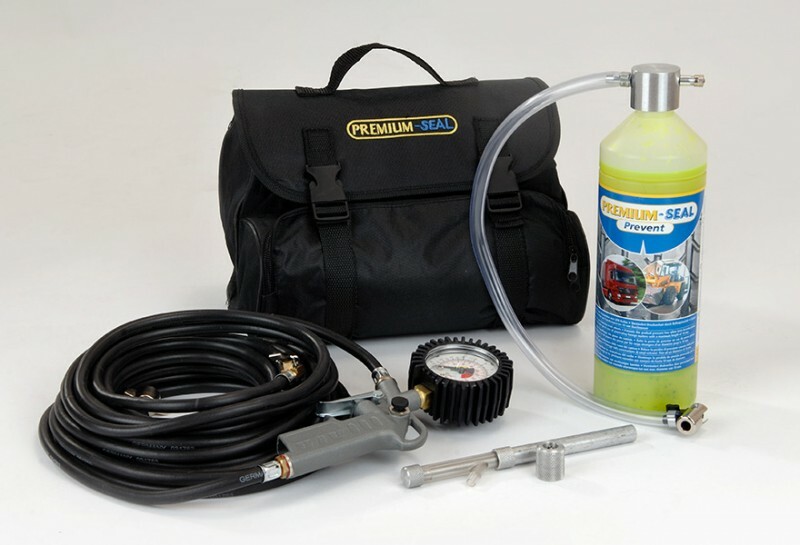 Tyre sealant in 1 l pressure bottle, 45 cm hose with valve connector, carrying bag, valve insert remover long, valve insert remover mini, 10 m hose with manometer. This tyre sealant has been newly developed to prevent chemical reactions with aerosols. The aerosol can provides more safety margin than is required by applicable regulations.